A world of blue, green and turquoise. Life beneath the surface features more than 30,000 known species of fish. You can meet several hundred of them at Universeum. The aquariums are among the biggest in the world and between them contain over three million litres of water. Let’s dive in! The Pacific, Atlantic and Indian Oceans are the three largest of the world’s oceans. Together they contain 1.368 billion cubic kilometres of saltwater, which is around 96 per cent of all the water on Earth (the remaining four per cent is fresh water). Two thirds of the planet’s surface is covered by water and that’s why we call it the Blue Planet. Behind the 16×4 m panoramic glass you can see the various fish species that live in the sea off the Swedish west coast. The glass, which isn’t really glass but scratch proof acrylic, is 27 centimetres thick in some places, in order to withstand the pressure from 900,000 litres of water. The cuckoo wrasse begins its life as a female. She is red in colour and lives in a harem with other females and a single male. Having grown to exactly 72 per cent of her maximum size she then changes gender and becomes blue. Hunts in swarms, sometimes numbering thousands. The spiny dogfish is most at home in deep water, so it is seldom seen. The largest of the flatfish family. Can grow to up to three metres in length and a weight of 320 kilos. Requires very little space and therefore makes an excellent aquarium fish! The greater weever can secrete a potent venom. Venomous fish are otherwise very rare in Swedish waters. The females firmly wrap their egg capsules around corals, seaweed and seagrass so that they will not drift away. However, sometimes they still do so and you can find the eggs washed up on land. The thornback ray is a nocturnal species. Feeds on all kinds of bottom animals, preferably crustaceans. A fully grown male can reach one metre in length. Widely distributed in a variety of habitats, from the shoreline down to the continental shelf. Omnivorous; feed at dawn or dusk on invertebrates and fish, including young cod. 1.4 million litres. That’s how much water Universeum’s largest aquarium, the Ocean Tank, contains. As you go into the tunnel that leads through the aquarium, you can view the fish from below and you almost feel as if you were among them. This tank is where our sharks and rays live, as well as a number of clownfish and other colourful characters of the coral reef. There’s also a large sawfish, whose characteristic nose is impossible to miss. Can be up to 4.3 metres in length and favours coral reef and delta environments. 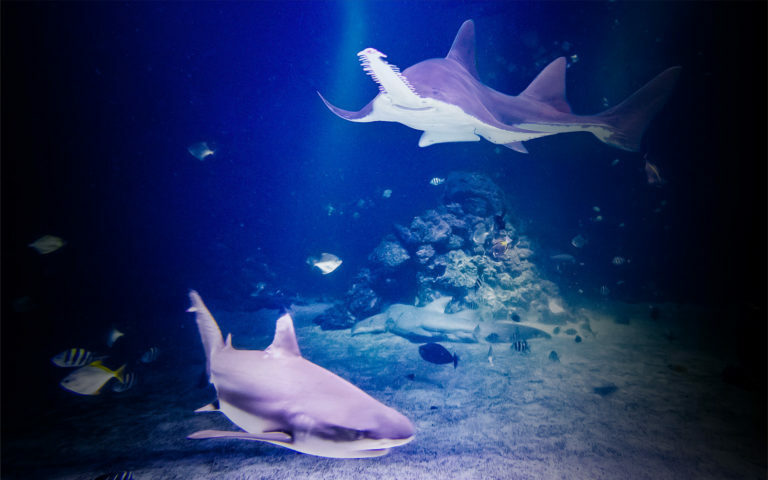 It has been known to attack humans, but in general this nurse shark is not a danger to humans. This fish belongs to the ray family and has one very distinctive feature: A “saw” in the middle of its face! This “snout” is naturally a highly-effective weapon when the sawfish needs to defend itself against predators. But it is also perfect for hunting and seeking out food. It is unusual for stingrays living in aquariums to breed, but this has happened here at Universeum! A clear sign that they feel at home here. Also known as the anemone fish, because it lives in a symbiotic relationship with anemones and corals. Like all surgeonfish, the palette surgeonfish has two sharp, extending “scalpels” at the base of its tail, from which it gets its name.